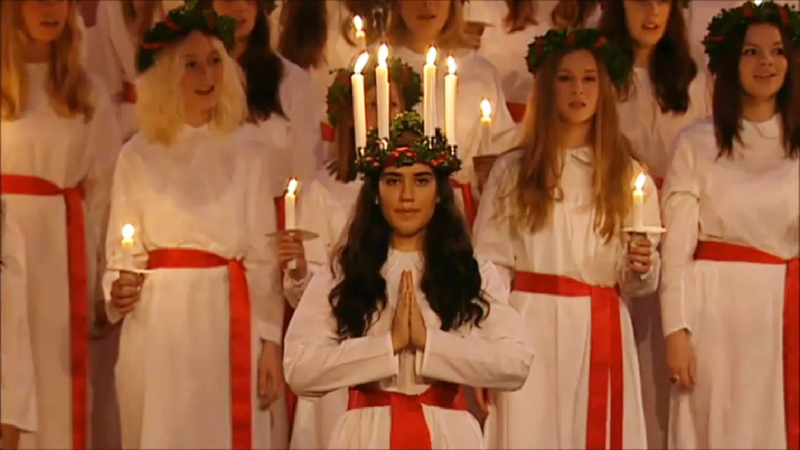 Filled with candlelight, white robes, singing, and saffron buns, Lucia in Sweden has evolved into a unique tradition that is observed throughout the country on December 13th. Although it isn’t an official holiday, Lucia celebrations are prominent from schools to universities and small towns to big cities. The origins and history of Lucia are quite complex, which actually made this post much later than I had hoped, but I’ll do my best to convey the highlights. Lucia (LOO-SEE-uh) is the patron saint of the blind and died around 3ooAD in Syracuse, Sicily. Legend has it that she consecrated her virginity to God, refused to marry a pagan, and gave her dowry to the poor. Her angry betrothed perhaps misunderstood that she had found another bridegroom and in revenge turned her over to the authorities as a Christian. To try and get her to renounce her Christian beliefs they threatened to drag her to a brothel but she was so filled with the Holy Spirit they couldn’t move her despite all efforts. They decided to burn her on the spot but the flames did not consume her. She bravely continued to profess her belief in God and was finally killed when a sword was driven into her throat. Saint Lucia’s popularity grew during the Middle Ages and around the 1500s many religious images began to depict her holding two eyes on a plate. A new legend evolved that she was tortured by the soldiers who gouged out her eyes. Another explanation is that her betrothed had admired her beautiful eyes so she gouged them out herself to protect her chastity. So how does a Catholic saint relate to Lucia in protestant Sweden? During the 10th century the popularity of celebrating Saint Lucia spread from France to Germany and England. Lucia is noted on the Swedish calendar as early as 1470 when Sweden was also Catholic. At that time December 13th was considered the shortest day of the year and the end of the fall work season. Pigs were often slaughtered on this day with a celebratory party that marked the beginning of the fast before Christmas. The tradition of Lucia survived the Reformation under King Gustav Vasa in the 16th century and continued to evolve. It wasn’t until the 20th century that Denmark, Norway and Finland adopted Lucia via Sweden. The name Lucia shares a root (luc-) with the Latin word for light, which is lux. But in Sweden the name Lucia has also been associated with the devil, Lucifer. In northern Sweden there is a legend that Lucia was Adam’s first wife. She consorted with the devil and their descendants formed an evil race in the underworld. The story goes that if you didn’t keep your children inside the night before Christmas they could be taken by Lucia. 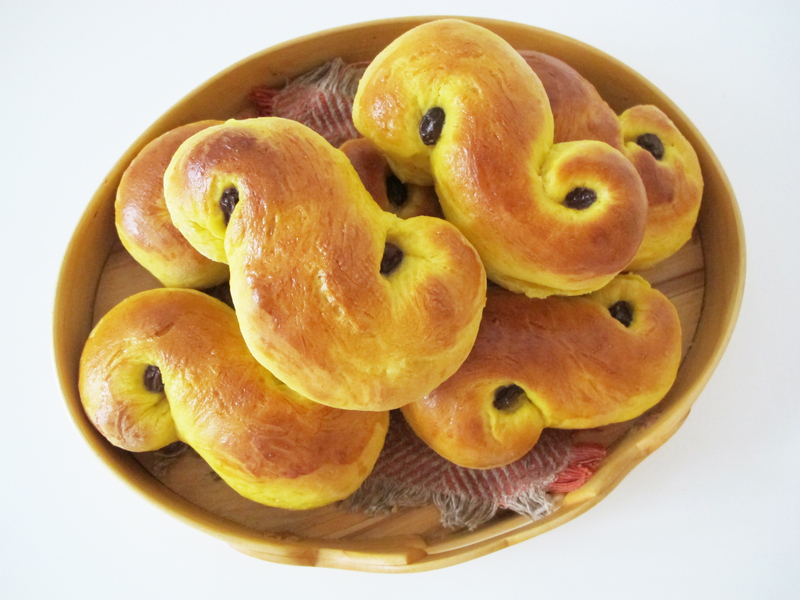 In Folk I Fest author Jan Öjvind Swahn states that Lucia buns, known as lussekatter, are reminiscent of the devil because in old Swedish tradition they were called djävulskatter, or the devil’s cat and the s-shaped form is intended to represent a cat curled up. The first recorded occurence of the Lussebruden, or Lucia Bride, bearing a breakfast tray with coffee and lussekatterna while wearing a crown of candles is in Skövde in Västergötland in 1764. Over time the tradition spread from the higher to the lower social classes. I wasn’t able to find anything definitive as to why the saffron was used other than in Årets Festdagar Nils-Arvid Bringeus suggests it may have begun within the celebrations of the higher classes who could afford such an expensive ingredient. The white-clad Lussebruden may have its original influences from German tradition but it has evolved uniquely in Sweden. In university towns Lucia marked the end of the fall term and was a time when students returned home for the Christmas break. There was a tradition that they would walk in groups from home to home throughout the countryside and sing in Latin and Swedish to receive gifts of food or money to continue their education. The tradition of singing was taken back to university towns and became an integral part of the Lucia celebration. It wasn’t until the 20th century that Lucia became a nationwide phenomenon. In 1927 Stockholm’s Dagblad (the daily paper) selected a Lucia to represent the city and lead an official procession. Other newspapers and cities throughout Sweden quickly picked up on the idea and today nearly every city and town has a Lucia. There are Lucias chosen within grade school classes, and even a national Lucia. Girls who are not chosen as Lucia wear white robes and carry candles in the procession. Boys join in as well dressed as stjärngossar (star boys) in white robes with star-decorated cone hats or as gingerbread boys bringing up the rear of the procession and carrying lanterns. The song for Lucia is a traditional Neapolitan tune. There are several different versions of Swedish lyrics but the original Swedish lyrics “Natten går tunga fjät” were created by journalist Sigrid Elmblad around the turn of the century. It’s popularity soared with the spread of the Lucia tradition throughout Sweden in the 1920s. Aside from celebrations in schools and eating lussekatter, there is typically a Lucia procession and concert in every town. In cities the Lucia is picked by a public vote on the candidates who are presented in the local newspaper. There is a ceremony where Lucia is crowned and a prominent person is selected to light the candles on the crown. Lucia and her attendants visit hospitals and invalids and sometimes there is a Lucia Ball at larger hotels or universities. A national concert and program is aired on TV. Overall Lucia is a lovely tradition to bring light to the dark days of the Swedish winter. Despite its relatively late insurgence into the mainstream culture, Lucia celebrations are quite common in Swedish communities outside of the country, namely in the United States. Click here for a video that explains this all somewhat with a bit of humor. The foods associated with Lucia are typically lussekatter (sweet buns made with saffron) glögg (mulled wine served with blanched almonds and raisins), coffee, and heart-shaped pepparkakor (gingerbread). Lussekatter, or Lucia buns, begin to make their appearance at bakeries around the first weekend of Advent and can be found throughout December. 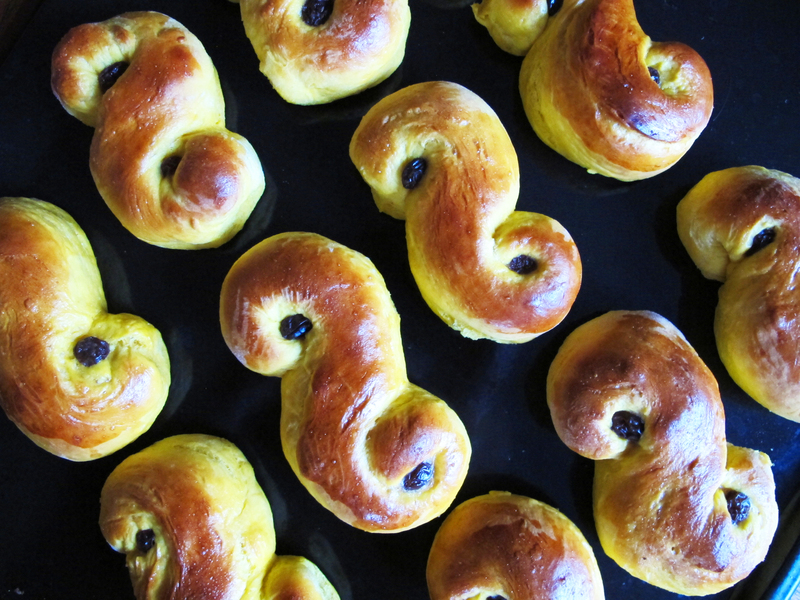 Saffron plays a significant role in Christmas baking in Sweden from Lucia buns to cakes. It is sold at the cash registers at supermarkets and pharmacies in 0.5 gram (.02 oz) packages that cost about 16sek ($2.30) each. 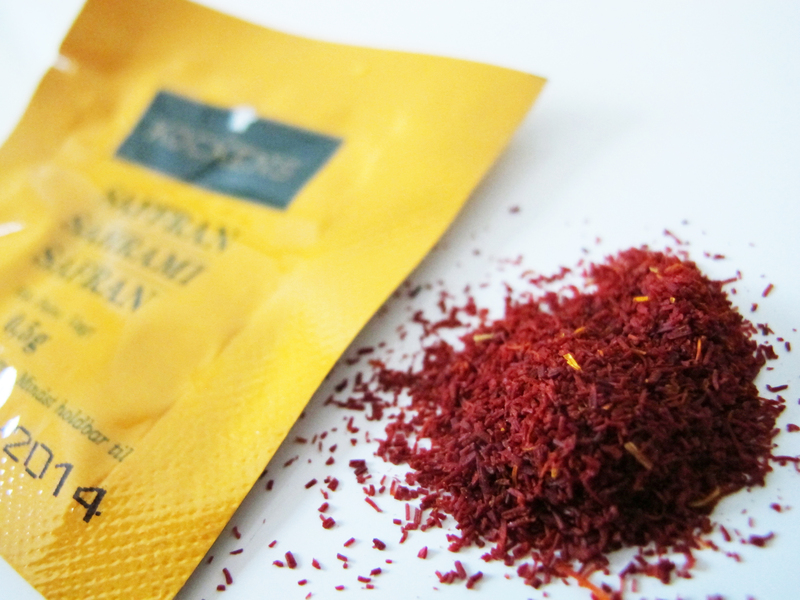 It is the most expensive spice in the world and is actually the stigmas of the saffron crocus flower. Each flower only produces three stigmas and it takes 50,000-75,000 flowers to produce one pound (450g) of useable saffron. Even though I didn’t grow up with the Lucia tradition, I nearly melted into tears at my first Lucia celebration when my oldest daughter bore her white Lucia gown and did the best that a 2-year-old could do with singing the song. The significance of the event is apparent by the masses of parents who show up in the dark winter morning with their children padded in layers of winter clothes under their Lucia gear since every effort is made to have the procession outside. Even though it’s dark out it’s soon like noon time as the flash bulbs fly like paparazzi and people jockey for a good position to snap a precious photo of their child celebrating Lucia. Although I am a confessed serial yeast killer, I gave two lussekatt recipes a try this year and found one to be decidedly preferable. I tried three different ways of twisting them….a figure 8, an S, and then a simple twist. The S and the twist were the most successful and now I have more Lucia buns than any family of four should have. Thank goodness my 4-year-old has taken a liking to them and is downing one for breakfast daily. There is no more space in the freezer and the bread dries out fairly quickly so I’m getting creative about what to do with all of those rolls. 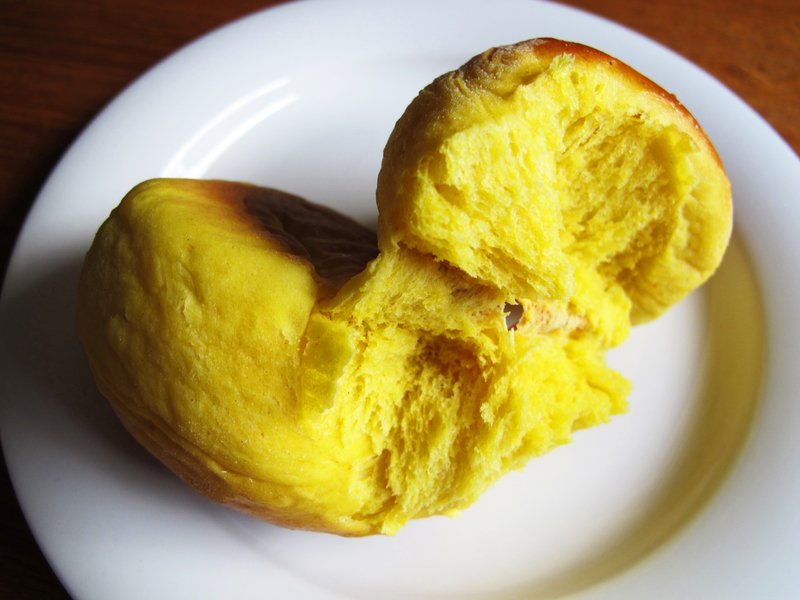 But there are still loads to dispose of and as good as they are, there are only so many Lucia buns one can eat. So if you also find yourself in the unusual situation of being inundated with Lucia buns, stay tuned. A quick follow-up to this post will be a Lucia bun bread stuffing that is divine with roast chicken. And they are fantastic in saffron bread pudding with cognac sauce. 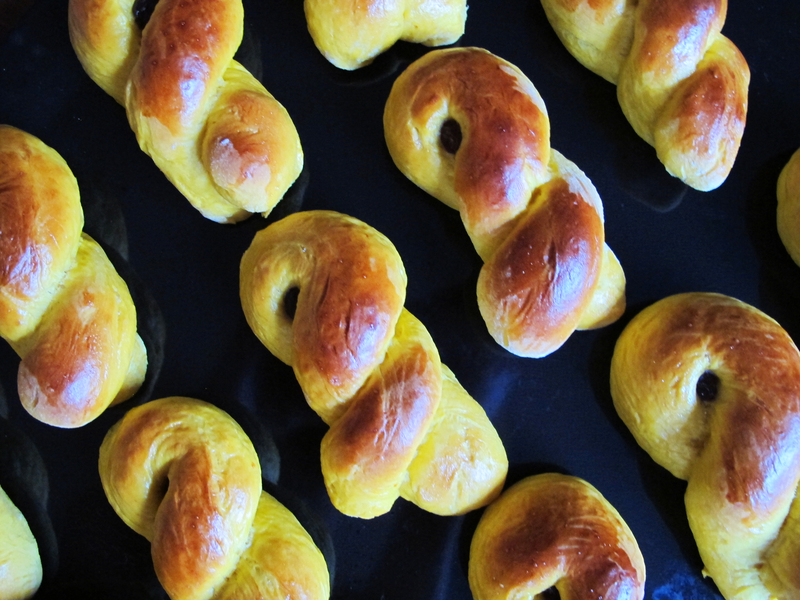 In the meantime, get to baking your Lucia buns. Even if they aren’t ready in time to eat for Lucia, we have a good chunk of December ahead of us so it’s not too late to enjoy them. To release the most flavor and color from the saffron, let it steep in the hot milk for at least 20 minutes and ideally up to 24 hours. If you are using saffron powder you can skip the steeping. The buns can be shaped into a variety of forms but the S-shape is the most common. Using an egg in the dough is optional. It makes the bread a bit less dense. 1. Place the raisins in a small bowl and add enough warm water to cover them. Soaking them for a couple of hours will help to keep them from getting rock hard during baking. If you do this step right at the beginning of your Lucia bun project they should be sufficiently soft by the time you are ready to bake the buns. 2. Heat the milk in a saucepan over medium heat until bubbles just begin to form on the sides of the pan. Remove from the heat and add the saffron, pushing down on the threads to submerge them (you can skip this step if using powdered saffron). Don’t use a wooden spoon as it will soak up the flavor of the saffron and you want all of that flavor to go into your baked goods, not your spoon. Let steep for at least 20 minutes and up to 24 hours. If steeping for an extended period of time, let the milk cool to room temperature and then refrigerate it. 3. Melt the butter in a saucepan over medium heat. Add the saffron milk and heat until just warm to the touch or 98°F (37°C). 4. Crumble the yeast into the bowl of your mixer. Pour in the butter and milk mixture and stir until the yeast is dissolved. Add the salt, sugar, egg, and most of the flour. Work the dough until it is sticky, but doesn’t stick to your hands. Use the minimum amount of flour possible to achieve this. 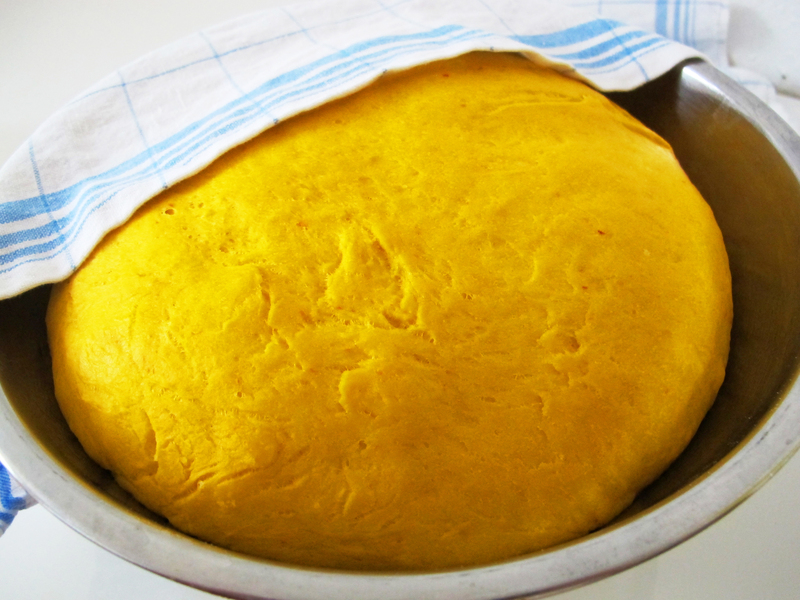 Let the dough rise in a lightly oiled bowl covered with a kitchen towel until doubled in size, about 30 minutes. 5. Place the dough on a lightly floured surface and knead until the dough is smooth adding flour as needed if the dough is too sticky. Line two baking sheets with parchment paper or lightly grease them. Work a fistful of dough into a 8″ (20cm) long snake and shape it into an “S” curling the ends in well and place on the baking sheet. Continue until all the buns are formed and let rise, covered with a kitchen towel, 30-40 minutes. 6. Preheat the oven to 475°F (250°C). 7. Drain the raisins. Once the buns have finished rising, place a raisin in the center of each curve on the “S.” Beat the egg in a small bowl and brush it over the tops of the buns. Bake the buns in the center of the oven for 5-10 minutes. When they are browned and sound hollow when tapped they are finished. The buns dry out quickly so once they have cooled to room temperature place them in an airtight container. If they do dry out too much, you can wrap them in a damp kitchen towel and heat in the microwave for a few seconds. Keep an eye on the towel so it doesn’t catch on fire. The buns also freeze really well so you can enjoy them for a longer period of time. *Fresh yeast is readily available in Sweden. If using dry yeast, the San Francisco Baking Institute recommends the following conversion: Active dry yeast can be used at 50% of the weight of fresh yeast and instant dry can be used at 40% of the weight of fresh. I had no idea; thought it was associated with Christmas. The procession we attended with your family in Malmo was extraordinarily beautiful. We’ll give it a try. You don’t make the foray into baking much either, so I’ll be interested to hear how this turns out for you. I’m not sure if you might need to do something to compensate for high altitude. Some pretty brutal moments in there that turned into quite the tradition. Interesting history! I still remember the day you called and talked to Ross and wondered why your yeast was all foamy and bubbly. At least that was a successful blooming of it. Sometimes I find that if my yeast isn’t starting well I just postpone my project for about 30 minutes and usually its going by the time I start up. Works just fine too once it takes off. Thanks for the post and recipe! I tried it last night and they turned out great. Because I can’t do dairy, I substituted with rice milk and lactose free butter and it was just fine. I can’t find the comment I wrote a few months back but you had asked where my husband was from in Utah and he’s from Spanish Fork. We moved to Malmo from Oregon for him to study at Lund. Next up to try is the aggakaka – thanks again! Hey Caryn. Thanks so much for posting that it worked out for you. It’s really valuable to know what dairy substitutions worked well too. I hope you will be just as happy with the äggakaka. Happy holidays! So glad you liked it. Yes, you are welcome to post the site on your blog. Thanks for sharing it. Happy Holidays! Tack ska du ha! Thanks for the recipe! I’ll compare it to the one I make which is in Swedish and I’m always unsure if I translate it correctly! 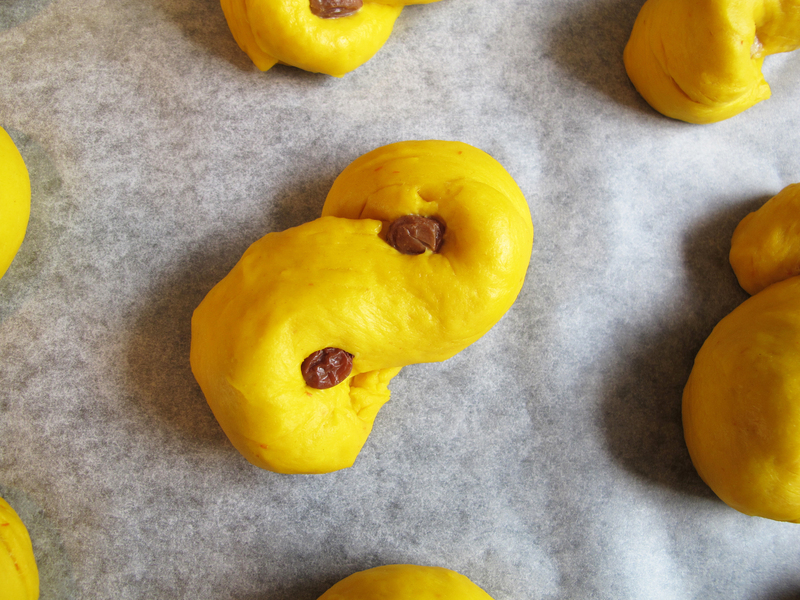 YUM, I’m so excited to make Lussekatter igen!